Yesterday, I thought of a girl from my past and, as soon as I thought of her, I realised that I’ve been thinking of her pretty-much once a week for years and years now. As blog post openings go, this may promise to be rather yearning and revealing and such but it’s not. It’s just my old pal Memory throwing one of its curve balls at me again. I met this girl for the first time in, oh, it must be thirty years on Monday last. It was at the sad occasion of her Father’s funeral. She was (and still is) a sister of one of my very best friends from my teenage and young adult years. Let’s call her M for that indeed is the initial of her name. When I met her again on Monday, I remarked to myself how little the years had changed her and how she still looked like the same M that she had looked like back in the Seventies and the Eighties. I never for one moment remarked that she entered my head roughly about once every week and had done for so many years. I didn’t know it then. I only knew it yesterday, when I was making dinner. Most Saturdays, I make Chilli. I make a big pot that satisfies the appetites of the most voracious of returning students and spice-seeking adults alike. If I say so myself, I make a great Chilli with all the freshest ingredients and the best, most potent spices. There are touches of vinegar and sugar and dark, dark chocolate. There are real fresh juicy chillies that I cut while wearing an old golf glove but still the burn works its way through to my fingers. There is also cumin and peppers and onions and… oh you know the score, it’s a Chilli after all and it’s not rocket science. It’s just that I’m quite proud of my one and I enjoy cutting everything up and preparing it and dishing it up and eating it. And, yesterday, as I reached a particular stage of making the Chilli, I thought of M and I suddenly realised that I thought of M every week as I come to this very stage of Chilli-making. The thought is a simple one and it’s not a romantic or an aching one, except perhaps in the sense that all memories are, to some extent or another. It’s just… a memory. M made me my first Chilli. We were at a party in my friends house. Their parents had gone away and we had all gathered there to play records and maybe dance a bit and eat a late night Chilli which I had never had before, my Mum not being adventurous in the culinary respect. To try to date the year in which this party happened, I remember that one of the favoured albums by the girls at the party was by Culture Club – Colour by Numbers so that puts us firmly in 1983. There is actually very little detail to the memory. It is primarily to do with kidney beans and it is at the kidney bean draining part of the my own Chilli making that I invariably think of M and that party. On that night, the Chilli was served up on large white plates on the compulsory bed of rice. I got my plate and sat down beside S. I inspected my plate. I had never seen a Chilli before and had certainly never set eyes on a kidney bean. “Kidney beans, they’re great,” this last part said in Tony-The Tiger fashion. 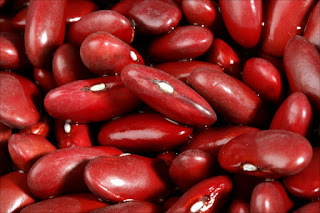 I remember how I carefully ate my way around all of the kidney beans and left them all to the side of my plate. Logic told me that they were called kidney beans on account of their kidney shape and not because they were some kind of little animal kidney, cruelly harvested to ‘meat up’ the stew. Nevertheless, I wasn’t going to eat them. No way. “’You having those?” S was eyeing up my stash of beans hungrily. S was always hungry. He ate them. All by themselves. Relishing them. I felt sick. Today, I would do the same thing. I love how the little beans soak up the Chilli essence. My son would look at me in the exact same way as I looked at S that night. That might be the key to the recurring memory. So, every Saturday, when I’m making my own Chilli in my own kitchen, and when I’m working on the kidney beans, I think in passing of A’s sister M, of the party and of Culture Club and of Chilli and kidney beans and youth and changing taste and of my sons and of time. And I realised all of this, not when I saw her again on Monday but a week later when it was time to cook. Well, this one niggling thought persists. Did I really think of M and her Chilli every Saturday for years? Or is it perhaps possible that I only thought of her yesterday for the first time in years. The memory having been spurred by the funeral and the visit to my home town and seeing my friend A again and the sad passing of Martin, his Dad, who was a lovely man. Maybe my mind has played a trick on me. Throwing me a memory but then going further. Implanting another memory of me recalling this memory all of the time when, in fact, I only ever remembered it once. It happens in dreams all of the time, perhaps it happened to me while waking too. I don’t know the answer. I don’t think I’m capable of discerning the answer. We are, to an extent, slaves to our memories and the vivid tricks they can sometimes play on us. They serve us up a rich banquet and we eat our fill and we never really know what is fresh and what has come out of a tin. Still the food is good and we eat it with some relish. I read a lot about memory. It’s always been of some interest to me but ever since I started having real problems with mine it’s become something of an obsession. And, of course, the more I read the more I realise even the finest minds haven’t a clue but they’re clearly enjoying the challenge. The last article I read was Our Brains Rewrite Our Memories, Putting Present In The Past. The title pretty much summaries the whole piece but it’s worth reading and it’s not long. It basically reinforces my dislike and distrust of the truth so-called. I’m not saying you haven’t thought of M. pretty-much once a week since the fall of 1983 but as you’ve said yourself you probably haven’t but it would’ve been nice if you had, a nice, innocent, happy memory for once. I’m not sure who made me chilli first. It certainly wasn’t my mother. Of that I am certain. But after that I couldn’t say. I couldn’t even tell you the first time Carrie made it but I can say I look forward to when she does. I do remember the first time I had fish fingers coated in batter. I can even tell you the date: 4 October 1964. That was the day the first episode of Stingray was broadcast and I had chips (crinkle-cut, I believe), garden peas (from a tin) and a new variety of fish fingers Birds Eye had just brought out (probably no more than three). And I ate it on a tray sitting two feet in front of the TV screen. Well, maybe three feet. As for the last time I ever ate Birds Eye Crispy Batter Fish Fingers (yes, they still make them) I have no idea. I couldn’t even tell you the last time I ate chilli. Actually I couldn’t tell you what I had for tea yesterday.